Skillful Home Recreation is proud to announce Bullfrog Spas - the best hot tub for you. 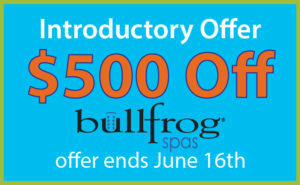 Home / Skillful Home Recreation is proud to announce Bullfrog Spas – the best hot tub for you. Skillful Home Recreation is proud to announce Bullfrog Spas – the best hot tub for you. The best hot tub is the one perfectly customized to you. Bullfrog Spas® are premium hot tubs designed to provide a truly personalized hot tub experience. Engineered with an ultra-efficient, patented technology called the JetPak Therapy System™ it is the only hot tub that can be easily re-configured and completely customized. Jet Paks are modular hot tub seats that can be interchanged at any time – now or any time in the future. The JetPak Therapy System® delivers incredible power, maximum massage versatility, and allows you to upgrade your spa’s jetting with new JetPaks anytime. With the JetPakTherapy System you can design and personalize your perfect hot tub experience. You select your favorite massages. You place them in your favorite seats. You dial in the therapy intensity so it feels best for you. You swap them out when you want a change.